City Connect pays tribute to Eric Blair or as he was better known, George Orwell born June 25th 1903 but sadly passed away January 21st 1950 from tuberculosis. At the age of five, Blair was sent to a small Anglican parish school in Henley, which his sister had attended before him. He never wrote of his recollections of it, but he must have impressed the teachers very favourably for two years later he was recommended to the headmaster of one of the most successful preparatory schools in England at the time: St Cyprian’s School, in Eastbourne, Sussex. Young Eric attended St Cyprian’s on a scholarship that allowed his parents to pay only half of the usual fees. Many years later, he would recall his time at St Cyprian’s with biting resentment in the essay “Such, Such Were the Joys,” but he did well enough to earn scholarships to both Wellington and Eton colleges. After a term at Wellington, Eric moved to Eton, where he was a King’s Scholar from 1917 to 1921. Later in life he wrote that he had been “relatively happy” at Eton, which allowed its students considerable independence, but also that he ceased doing serious work after arriving there. Reports of his academic performance at Eton vary: some claim he was a poor student, others deny this. It is clear that he was disliked by some of his teachers, who resented what they perceived as disrespect for their authority. In any event, during his time at the school Eric made lifetime friendships with a number of future British intellectuals. After finishing his studies at Eton, having no prospect of gaining a university scholarship and his family’s means being insufficient to pay his tuition, Eric joined the Indian Imperial Police in Burma. He resigned and returned to England in 1928 having grown to hate imperialism (as shown by his first novel Burmese Days, published in 1934, and by such essays as ‘A Hanging’, and ‘Shooting an Elephant’). He adopted his pen name in 1933, while writing for the New Adelphi. He chose a pen name that stressed his deep, lifelong affection for the English tradition and countryside: George is the patron saint of England (and George V was monarch at the time), while the River Orwell in Suffolk was one of his most beloved English sites. Orwell lived for several years in poverty, sometimes homeless, sometimes doing itinerant work, as he recalled in the book Down and Out in Paris and London. He eventually found work as a schoolteacher until ill health forced him to give this up to work part-time as an assistant in a secondhand bookshop in Hampstead, an experience later recounted in the short novel Keep the Aspidistra Flying. Soon after the outbreak of the Spanish Civil War, Orwell volunteered to fight for the Republicans against Franco’s Nationalist uprising. As a sympathiser of the Independent Labour Party (of which he became a member in 1938), he joined the militia of its sister party in Spain, the non-Stalinist far-left POUM (Workers’ Party of Marxist Unification), in which he fought as an infantryman. In Homage to Catalonia he described his admiration for the apparent absence of a class structure in the revolutionary areas of Spain he visited. He also depicted what he saw as the betrayal of that workers’ revolution in Spain by the Spanish Communist Party, abetted by the Soviet Union and its secret police, after its militia attacked the anarchists and the POUM in Barcelona in May 1937. Orwell was shot in the neck (near Huesca) on May 20, 1937, an experience he described in his short essay “Wounded by a Fascist Sniper”, as well as in Homage to Catalonia. He and his wife Eileen left Spain after narrowly missing being arrested as “Trotskyites” when the communists moved to suppress the POUM in June 1937. 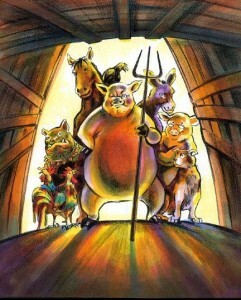 In 1944 Orwell finished his anti-Stalinist allegory Animal Farm, which was published the following year with great critical and popular success. The royalties from Animal Farm provided Orwell with a comfortable income for the first time in his adult life. From 1945 Orwell was the Observer’s war correspondent and later contributed regularly to the Manchester Evening News. He was a close friend of the Observer’s editor/owner, David Astor and his ideas had a strong influence on Astor’s editorial policies. In 1949 his best-known work, the dystopian Nineteen Eighty-Four, was published. He wrote the novel during his stay on the island of Jura, off the coast of Scotland. Between 1936 and 1945 Orwell was married to Eileen O’Shaughnessy, with whom he adopted a son, Richard Horatio Blair (b. May of 1944). She died in 1945 during an operation. In the autumn of 1949, shortly before his death, he married Sonia Brownell. In 1949 Orwell was approached by a friend, Celia Kirwan, who had just started working for a Foreign Office unit, the Information Research Department, which had been set up by the Labour government to publish pro-democratic and anti-communist propaganda. He gave her a list of 37 writers and artists he considered to be unsuitable as IRD authors because of their pro-communist leanings. The list, not published until 2003, consists mainly of journalists (among them the editor of the New Statesman, Kingsley Martin) but also includes the actors Michael Redgrave and Charlie Chaplin. Orwell’s motives for handing over the list are unclear, but the most likely explanantion is the simplest: that he was helping out a friend in a cause – anti-Stalinism – that both supported. There is no indication that Orwell ever abandoned the democratic socialism that he consistently promoted in his later writings – or that he believed the writers he named should be suppressed. Orwell’s list was also accurate: the people on it had all at one time or another made pro-Soviet or pro-communist public pronouncements. Orwell died at the age of 46 from tuberculosis which he had probably contracted during the period described in Down and Out in Paris and London. He was in and out of hospitals for the last three years of his life. Having requested burial in accordance with the Anglican rite, he was interred in All Saints’ Churchyard, Sutton Courtenay, Oxfordshire with the simple epitaph: Here lies Eric Arthur Blair, born June 25th 1903, died January 21st 1950. Tagged birthday, books. Bookmark the permalink.